Boulton and Watt, coming to a bank note near you. The Bank of England has announced that engineer James Watt and his business partner Matthew Boulton are to replace the first Governor of the Bank of England, Sir John Houblon, on the £50 note. This is a very welcome development, even though James Watt was a Scot. No offence to any Scots who might happen to be reading, but you do have your own bank notes, and we are supposed to be talking about the Bank of England here. Sir John Houblon never deserved his place on the £50 note. His appearance on the note was a classic example of British establishment cronyism at its worst. Clearly, the Bank of England wanted one of its own on one of its own bank notes. Jobs for the lads, and all that. Not that Sir John Houblon was the first money-man to appear on a Bank of England note: Sir Isaac Newton beat him to that honour by several years by appearing on the back of the long-defunct £1 note. Sir Isaac clearly deserved his place on a bank note for his magnificent scientific achievements, but I more than half suspect that the Bank of England chose him for his work as Warden of the Royal Mint. Jobs for the lads again, you see. And then, to add insult to injury, they went and chose Adam Smith to appear on the latest incarnation of the £20 note—yet another money-man (and yet another Scot, I might add)! 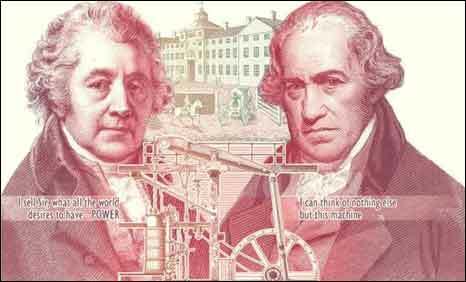 Although I applaud the choice of Boulton and Watt for the latest bank note, it does cause me a degree of sadness. It seems very likely that the next bank note to be replaced will be our beloved Darwin tenner. Not in Darwin's bicentenary year, surely, but some time fairly soon. I wonder which Scots money-man they will choose to replace him. William Paterson ... the instigator of the Darien Scheme ? Don't forget that they have put a Scotsman (Adam Smith) on a Bank of England note before, replacing the English composer Elgar, who is buried just a few miles away from where I am writing this in Malvern!